As a company we care about our customers, their opinions and experiences above all else. We understand that moving is stressful enough, without picking the wrong service to assist you on the big day. In our experience we acknowledge the fact that our customers prefer to opt for a company either recommended by a friend or family member first and formost, however, a company who can showcase their reviews also gives you the option to create your own opinion. Here at Fast Track Removals & Services Ltd, we feel it is imperitive our customers both new and exisiting get to read what people think of us. This is why we have recently become registered members of Checkatrade. 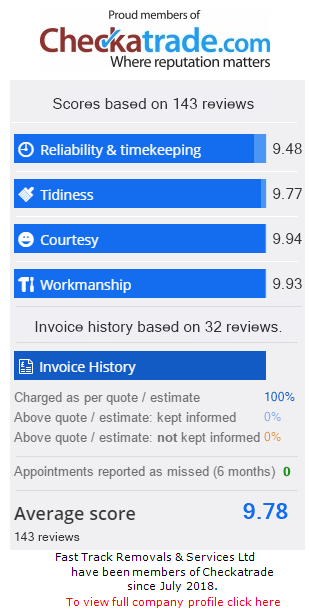 You can read our customer reviews below and see the link to our Checkatrade profile. Friendly & Professionals Service, made sure our move was stress free.